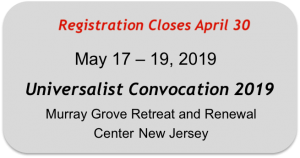 The Universalist Convocations: How we began. From Universalist Convocation 1990 Readings, edited by The Reverend Vernon Chandler. In October 1990 approximately one hundred individuals from thirteen states representing 24 different Universalist heritage churches convened for two days at historic Shelter Neck, North Carolina for the first Universalist Convocation. The convocation, sponsored by the Universalist Convention of North Carolina, was hosted by the Outlaw’s Bridge and Red Hill Universalist churches. The primary goal of the convocation was to bring together individuals and churches of Universalist heritage for the sharing of church histories, for discussing Universalist theology, and to explore means of promoting and strengthening the Universalist heritage within the Unitarian Universalist Association. Originally planned as a first-ever joint meeting of Georgia, North Carolina, and Pennsylvania Universalist Conventions, news of Universalist Convocation 1990 attracted numerous guests from outside the three-state convention area. A committee of six persons was appointed for the purposes of (1) exploring the organizational procedures for such a “Universalist Heritage Foundation,” (2) beginning the planning for a Universalist Convocation 1991 (now scheduled for Murray Grove, New Jersey, September 20-22, 1991), and (3) contacting all Universalist heritage churches within the UUA prior to next year’s convocation to encourage the sending of representatives. Members of this “Universalist Convocation 1991 Steering Committee” include Frank Beatty, Poplarville, MS; William K Hardeman, Raleigh, NC; Peggy Jones, Seven Springs, NC; Justin Lapoint, Lanoka Harbor, NJ; John C Morgan, Wilkes Barre, PA; and Albert C Niles, North Sebago, ME. There was a wonderful spirit surrounding the Shelter Neck Convocation. But perhaps this “spirit” was nothing new. In the words of my colleague, Al Niles, “the power of the meeting at Shelter Neck was the revival of a spirit early Universalists could always generate when they got together.” May there be many more such Universalist gatherings in the years to come and may this Universalist spirit continue to abide among and within us.